My Ninja is so excited. wanting to go right then. So for us June 24th can not come fast enough. who have yet to see the trailer. Tell me which character is your favorite in the movie. Winner will be chosen via random.org and will have have 48 hours to claim prize. *This giveaway is sponsored by Disney Pixar. All opinions are 100% mine honest and true. we just love mater in this family! And I follow you on twitter too!! I am a new follower & we loves Cars!!! 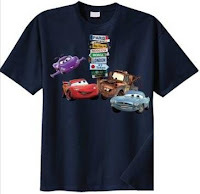 Our favorite character is Lightnig Mcqueen, but I have a thing for Mater! I like cars 2 on FB! I like the Professor Z character from this new movie. I know he is the bad guy but he seems really funny to me! Mater has always been my favorite! 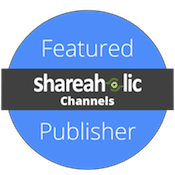 I'm your newest follower via GFC! In the new movie, I love Holley Shiftwell! I like Cars 2 on Facebook! I like Cars 2 on FB. I follow Cars 2 on Twitter. 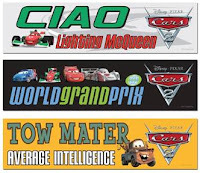 I'm a big Mater fan! My nephew loves Lightning McQueen! I requested to follow you on Twitter! Lightning McQueen is our favorite! I followed Cars on Twitter! I liked Cars on Facebook! Mack is our favorite character. 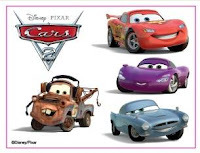 Can't wait to see Cars 2!